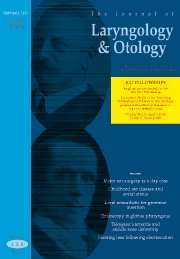 Robin Youngs, Guy Kenyon,	The Journal of Laryngology & Otology, Volume 120 Issue 1, pp 1-2. Day-case major ear surgery: is it viable? Abdul A Qureshi, Nigel D Padgham, Dan Jiang,	The Journal of Laryngology & Otology, Volume 120 Issue 1, pp 5-9. Selis Guven, Abdullah Tas, Mustafa K Adali, Recep Yagiz, Cem Uzun, Muhsin Koten, Ahmet R Karasalihoglu,	The Journal of Laryngology & Otology, Volume 120 Issue 1, pp 10-15. S K Chadha, A K Agarwal, A Gulati, A Garg,	The Journal of Laryngology & Otology, Volume 120 Issue 1, pp 16-19. Is phenol a safe local anaesthetic for grommet insertion? Alasdair Robertson, Russell Whitwell, Jonathon Osborne,	The Journal of Laryngology & Otology, Volume 120 Issue 1, pp 20-23. Alok Sharma, Tim Price, Kathleen Mierzwa, Paul Montgomery, Asad Qayyum, Tim Bradnam,	The Journal of Laryngology & Otology, Volume 120 Issue 1, pp 24-31. A Y Isa, C Macandie, B W Irvine,	The Journal of Laryngology & Otology, Volume 120 Issue 1, pp 32-37. B Ollivere, K Duce, G Rowlands, P Harrison, B J O'Reilly,	The Journal of Laryngology & Otology, Volume 120 Issue 1, pp 38-41. Rigid endoscopy in globus pharyngeus: how valuable is it? Y M Takwoingi, U S Kale, D W Morgan,	The Journal of Laryngology & Otology, Volume 120 Issue 1, pp 42-46. Mohamed H Abd El-Monem, Alaa H Gaafar, Emad A Magdy,	The Journal of Laryngology & Otology, Volume 120 Issue 1, pp 47-55. Hersad M Vaghela, Andrew A Moir,	The Journal of Laryngology & Otology, Volume 120 Issue 1, pp 56-58. V J Possamai, H Griffiths,	The Journal of Laryngology & Otology, Volume 120 Issue 1, p 77. The Journal of Laryngology & Otology, Volume 120 Issue 1, pp 79-84.